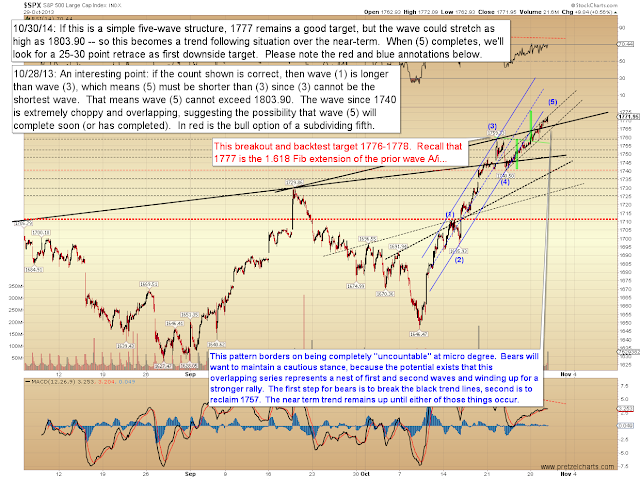 Last update, we discussed the fact that the market had reached a larger inflection point, and that one targeting method suggested SPX 1777 (+/-) as a possible target zone for this wave at intermediate degree. We're almost there; and it's worth mentioning that the long-term charts indicate rising trend resistance is approaching. 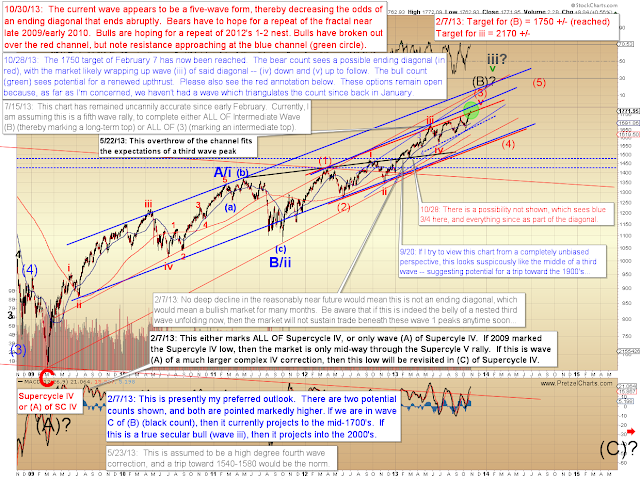 As I see it, we're now in a do-or-die situation for bears, and I'll outline this with a couple charts. If this market clears approaching long-term resistance, I think we have to go back into trend following mode until proven otherwise. First things first, of course, but I want to put that warning out there well ahead of time. The 30-minute chart shows the recent breakout over a cup and handle formation which, interestingly, also targets roughly 1777. If this is a standard five-wave rally, then it should be nearing completion -- but please note the caveat in blue on the chart below. Always interesting when the charts align with an event, and today we have the FOMC announcement. If trading today, keep in mind that the first semi-convincing directional move in the wake of the announcement is sometimes a fake-out. The next chart hasn't been updated since July 17, but it's become relevant again, since the Nasdaq Composite is now on the cusp of capturing my intermediate target zone. What's particularly interesting on this chart is Nasdaq's recent breakout over a 39-year trend line -- and while that's par for the projection, it always looks more convincing once the market actually realizes the projection and breaks out... so as this target approaches, bears are moving into a do-or-die intermediate inflection zone. The last time we saw an inflection zone of this magnitude was back in December 2012. In conclusion, SPX and Nasdaq are both approaching major intermediate inflection points. As I see it, this is a zone where bears will either need to make a stand or head back into hibernation for the foreseeable future. Trade safe. 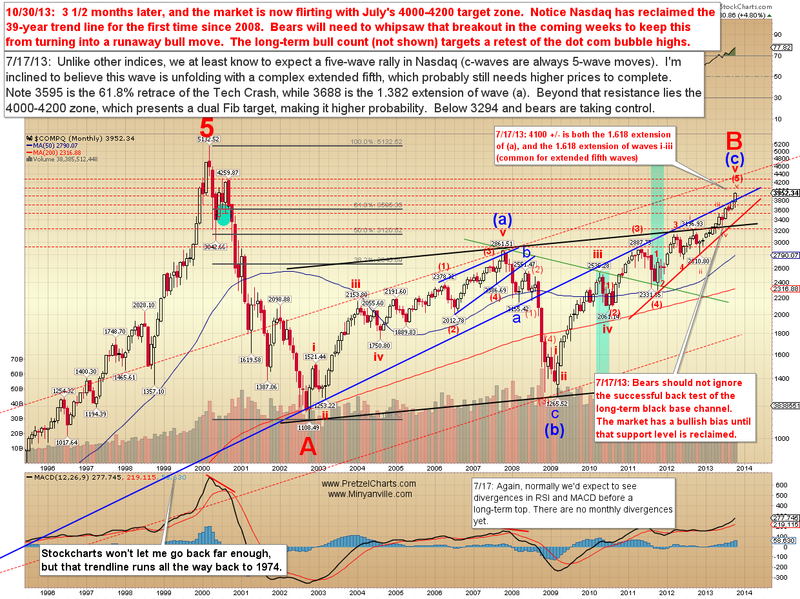 Nasdaq Comp, indeed to the low 4000s soon, probably 4400/4600 by late spring 2014. Intermediate 15/25% drop...then DOUBLE UP across following 12-18mths. Yeah...surpassing the 2000 bubble high of 5100s...maybe as high as 6000/7000. Have a fun FOMC day! Nice update PL, thanks for all you do!